For many years it has been the consensus among evolutionists that the australopithecines (various species within the genus Australopithecus) were intermediate between Man and the apes, indicating that this creature was on the direct evolutionary line between Man and the hypothetical common ancestor of apes and Man (see Evolution: The Fossils Say No!, D. T. Gish, pp. 72-112). The first specimen was discovered by Dr. Raymond Dart in 1924. Dr. Louis Leakey and his wife Mary in 1959 uncovered the skull of a creature they named Zinjanthropus bosei, which they claimed at the time was hitherto unknown and was an important link in man's evolution. Later research by others and by Leakey, himself, established that his Zinjanthropus ("East Africa Man") was simply another variety of Australopithecus ("Southern Ape"). Leakey even began to suggest the possibility that the australopithecines were outside of the direct line leading to man — a sterile sidebranch. Two aspects of the australopithecine morphology that were hailed by evolutionists most widely as indicating a transitional status for this creature were his dental characteristics and the alleged evidence for habitual bipedal gait. The dental evidence cited is the fact that, although these creatures, believed to have weighed 60-70 pounds, had cheek teeth as large as those found in 400-pound gorillas, thus possessing massive jaws, their front teeth (incisors and canine teeth) were relatively small in comparison with their cheek teeth when compared to the relative size of incisors and canines to cheek teeth in modern apes. A recent article entitled "Australopithecus vs. the Computer" in the University of Chicago Magazine (Winter 1974, p. 8) by Dr. Charles F. Oxnard, professor in the Departments of Anatomy and Anthropology, reports the results of his computerized multivariate analysis of Australopithecus in comparison with similar analyses of Man and modern apes (this article is adapted from his book, Uniqueness and Diversity in Human Evolution: Morphometric Studies of Australopithecines, published in 1975 by the University of Chicago Press). According to Dr. Oxnard, his analyses show that Australopithecus was not intermediate between Man and the apes but was uniquely different. Australopithecus was, in fact, as different from both Man and the apes as either is from the other. This should be sufficient to banish Australopithecus as a candidate for Man's alleged ape-like ancestor, and thus to practically clear the field of supposed transitional forms between Man and the apes. It is rather difficult to give a simplified description of the statistical multivariate analysis method. Particular points on, say the pelvis or a chimpanzee, may be measured with respect to a three-dimensional coordinate system. These same points on the pelves of other apes, Man, and Australopithecus can likewise be measured using the same axes used for the chimpanzee pelvis. After correlating these swarms of points, the relations among the swarms are then determined with respect to some other set of coordinate axes. Geometrically this is the equivalent of constructing and viewing from one position a three-dimensional model of the swarms and then rotating and viewing the model from a new position that best separates the swarms. In order to analyze the data from an object on which many measurements have been made in several species, a computer must be used, but this method allows a comparison of an anatomical feature of various creatures from a multitude of vantage points. It results in an objective evaluation of a large amount of data rather than a subjective assessment of a limited amount of data. 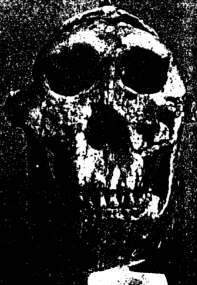 According to Oxnard's multivariate analyses of Man, various apes, and fossil material of Australopithecus, the australopithecines were uniquely different from any living form to a degree comparable to the difference between Man and any of the apes, or between any of the apes themselves. He believes further that these creatures, in exhibiting unique morphology, may also have been functionally unique, using a form of locomotion unlike any known form. The result of analyzing all available features of the pelvis, for example, of fossil Australopithecus, Man, and the apes showed that the fossil australopithecine pelvis is not intermediate between the pelves of ape and Man but is in fact uniquely different from the pelves of both living forms. A similar analysis of a finger bone of "Home habilis," so-named by Louis Leakey but judged by Oxnard, and others3,4 to be simply a variety of the australopithecines, indicated that this creature would have been inefficient at knuckle-walking but efficient in a hanging-climbing mode of locomotion. A multivariate analysis of the toe bones of Man, the apes, and a fossil australopithecine, Olduvai Hominid 10, showed that the fossil is uniquely different from both Man and African apes. In fact, multivariate analyses of several anatomical features, including the shoulder, pelvis, ankle, foot, elbow, and hand, according to Oxnard, suggest that the "common view," that these fossils are similar to modern man or that on those occasions when they depart from a similarity to man they resemble African great apes, may be incorrect. He suggests instead that most of these fossil fragments are in fact uniquely different from both Man and "man's nearest living genetic relatives, the chimpanzee and gorilla." While making clear that he does not wish to imply a genetic affinity of Australopithecus with the orangutan, Oxnard states that to the extent the australopithecines resemble living forms, they tend to be with the orangutans, not Man. Oxnard's conclusion is that "We may well have to accept that it is rather unlikely that any of the australopithecines, including 'Homo habilis,' can have had any direct phylogenetic link with the genus Homo." Oxnard reviews evidence produced by Richard Leakey and others of fossil material indistinguishable, or nearly indistinguishable, from modern man allegedly three to four million years old (see Evolution: The Fossils Say No!, pp. 105-107; also -- D. T. Gish, ICR Impact Article #11, "Richard Leakey's Skull 1470," 1974). He also mentions the view commonly held by evolutionists that the speed of psycho-social evolution is enormously greater than the rate of biological evolution. If, as now increasingly accepted by evolutionists, Man was present on the earth four million years or more ago, this poses two problems for evolutionists. It not only makes Man older than his alleged ancestors (which are being eliminated by the latest research anyhow), but also presents the problem of why his psycho-social evolution stood still for nearly four million years after his biological evolution was complete. We strongly suggest the alternative view that biological evolution has not occurred, and that the evidence for Man's first use of agriculture, domestication of animals, and urban living sometime within the last 10,000 years, at the most, indicates a recent creation of man rather than biological evolution over a span of many millions of years. During some of Louis Leakey's later excavations, he discovered remains of a creature resembling the australopithecines but which Leakey believed was more advanced. He gave this creature the name Homo habilis ("handy man"), because he believed that it was sufficiently advanced to be placed in the genus Homo and that it was the user of the so-called "pebble tools" he had earlier assigned to his "Zinjanthropus." As mentioned earlier, Oxnard and others insist that H. habilis is simply a variety of the australopithecines. The so-called Java Man and Peking Man creatures are supposed to represent an even more advanced form, and have been placed in a single species, Homo erectus. Even some creationists have accepted H. erectus as being fully human. I have earlier detailed why I believe the evidence indicates that Weidenreich's model of Peking Man, on which these opinions have been based, borders on fraud, and that Java Man and Peking Man were most likely large monkeys or apes of some kind. Eugene Dubois, the discoverer of Java Man, maintained during the last 15 years of his life that his Java Man was merely a giant gibbon. There are a few fossils found elsewhere which have been assigned to H. erectus which might actually be true men, since it is said by some that these fossils would have been assigned to Neanderthal Man except for the fact that their supposed ages were too old to include them with Neanderthal Man. It is most likely that the dates assigned to these samples are much too old, and that these creatures were actually remains of Neanderthal Man, now known to be as human as you and I. Evidence that seems in itself sufficient to completely invalidate an Australopithecus - Homo habilis - Homo erectus - Homo sapiens evolutionary line was uncovered by Louis Leakey himself. Leakey has reported that he found the remains of a juvenile Homo habilis in Bed I at Olduvai Gorge at a lower level than he had found an australopithecine in the same bed. Furthermore, Leakey has found evidence of both Australopithecus and Homo habilis above Bed I in Bed II, contemporary with Homo erectus.8,9 This would establish the contemporaneous existence in the same area of Africa of Australopithecus, Homo habilis, and Homo erectus, hardly conducive to the idea that Australopithecus had evolved into H. habilis, which had then evolved into H. erectus. Even more astounding (to evolutionists) was Leakey's report that he had found the remains of what appeared to be a circular stone habitation hut right at the bottom of Bed I!9,10 It has long been held that deliberate manufacture of shelters could have been performed only by modern Man. This evidence clearly indicates then that Australopithecus (and the so-called H. habilis), H. erectus, and modern Man were contemporary inhabitants of the same area. This evidence is inconsistent with an evolutionary origin of Man and the apes. Kelso reacts to this evidence in the first edition of his book by casting doubt on Leakey's data and interpretations simply because these do not fit into evolutionary assumptions.9 In the second edition of his book, published in 1974, he solves the difficulty by simply eliminating any mention of the circular stone habitation hut, and replacing his discussion in the text of Leakey's report of the contemporaneous existence of Australopithecus, H. habilis, and H. erectus by a brief reference in a table,11 thus effectively suppressing this evidence. As more and more evidence accumulates, the creationist position strengthens and evolutionary interpretations become more and more untenable. 1 R.E.F. Leakey, Nature, Vol. 231, p. 244 (1971). 2 Science News, Vol. 100, p. 357 (1971). 3 D.R. Pilbeam, The Evolution of Man, Funk and Wagnalls, New York, 1970. 4 J.T. Robinson, Nature, Vol. 205, p. 121 (1965). 5 A. Montagu, Man: His First Million Years, World Publishers, Yonkers, New York, pp. 51, 52 (1957). 6 R.E.F. Leakey, Nature, Vol. 231, p. 241 (1971). 7 Science News, Vol. 99, p. 398 (1971). 8 M.D. Leakey, Olduvai Gorge, Vol. 3, Cambridge U. Press, 1971, p. 272. 9 A.J. Kelso, Physical Anthropology, 1st Edition, J.B. Lippincott Co., New York, 1970, p. 221. 10 M.D. Leakey, op cit., p. 23-24. 11 A.J. Kelso, Physical Anthropology, 2nd Edition, J.B. Lippincott Co., New York, 1974, p. 178. * Dr. Duane T. Gish earned his B.S. in Chemistry from the University of California at Los Angeles and his Ph.D. in Biochemistry from the University of California at Berkeley. He has held appointments at Berkeley and Cornell University and spent eleven years in biochemical and biomedical research at The Upjohn Company. An author of numerous scientific papers and books on scientific creationism, Dr. Gish is a member of the Board of Directors of the Creation Research Society and is Professor of Natural Science at Christian Heritage College. Cite this article: Gish, D. 1975. Man...Apes...Australopithecines...Each Uniquely Different. Acts & Facts. 4 (9).